Bring out the best of fresh strawberries with this simple, healthy pie: Fresh Strawberry Glace Pie. It’s only 3 simple ingredients in a sweet graham cracker crust. One of our most popular Pie Recipes, this post was originally posted in June 2014. Sadly the strawberry farm has sold. But we now drive a few more miles to another brand new strawberry farm owned by three farming sisters: Kerns Family Orchard! Would you like to buy a strawberry farm? Relish the thought! You could have this Fresh Strawberry Glace Pie for breakfast every morning of strawberry season. 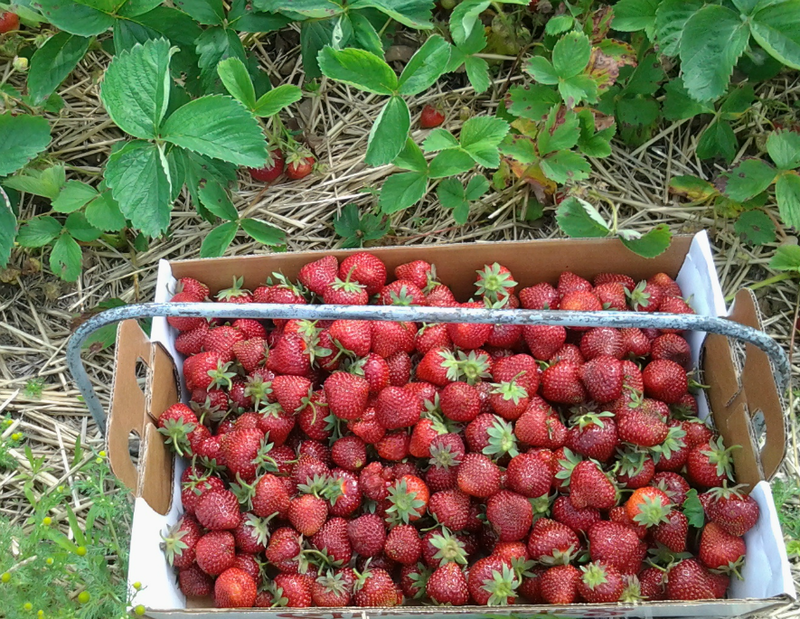 Believe me, I really thought this through….as I picked 21 pounds at George’s Berry Patch on Tuesday. 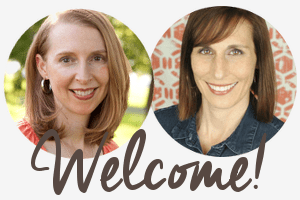 I’d have four farm workers right off the bat (my four kids) – and they’d grow up knowing that a hard YEAR of work would result in a few weeks of all the sweet, red, juicy fruit they could pick. 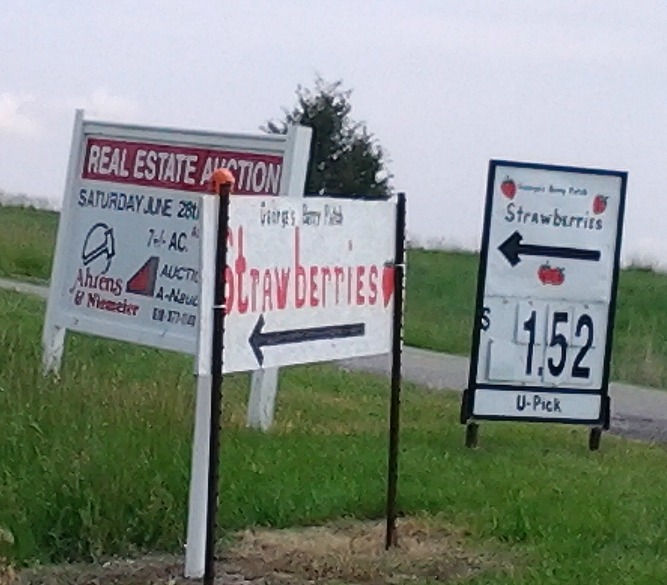 We would put up a cute sign: “U-Pick Sweetest Strawberries Around.” And if you or I don’t buy this strawberry farm, I might soon be driving by “Strawberry Fields Housing Development”…and sighing. I think the auction is June 28. Want to out-bid me? Until then, I’ll make a few more of these simple (healthy!) pies that highlight the super sweet fresh berries…and if you don’t wait for it to set (which we didn’t) you can make it in about 15 minutes and eat it right then and there. For the glace (or glaze), puree 1 heaping cup strawberries and 1/2 cup water in a blender or food processor; add water until puree equals 1 1/2 cups. In a medium saucepan, combine sugar and cornstarch; stir in berry puree. Cook and stir over medium heat until mixture is thickened and bubbly. Cook, stirring 2 minutes more. Cool 10 minutes without stirring. Spread about 1/3 cup glace over bottom of graham cracker crust. Arrange remaining berries, stem side down, in crust. Carefully spoon remaining glaze over fruit covering each piece. Chill 1-2 hours. Would you ever buy a farm? I probably won’t. Would you ever pick 21 pounds of berries? Thanks for the mention, Serena! This pie looks so fresh and delicious! I want to dive right in. Love how simple it is too. Our strawberry fields are now open and I can’t wait to take my kids. OH, Betsy…check back in to tell us what you make with the kids and strawberries! Enjoy! I certainly would be interesting to own a strawberry farm, but making homemade strawberry pie is almost as good 🙂 This looks awesome, love how gooey the berries look! Thanks! The glace is definitely delicious and so easy…and makes the pie look fancy. What a beautiful pie! And, yes, I would live to buy a farm one day (seriously) , although I had always thought about having goats , but now I’m thinking goats AND strawberries, and then I could make a pie with strawberries and goat cream cheese. Sold!!! I’m grinning right now at that comment, EA! And oh, boy am I grinning at the thought of strawberries and goat cheese too. (: You are pretty brilliant girl! That pie looks so pretty, and delicious 🙂 Makes me want to go strawberry picking. If I had any money at all, I would totally go into the strawberry growing business with you! That would pretty much make my life. This pie looks glorious! Love how the strawberries really get to shine! I just picked about 10 pounds of strawberries. (Going back for more in a few days). Looking forward to making this this weekend, along with canning some strawberry jam. I have 1 question. How do I measure 2 quarts of fresh strawberries? Serena is offline for the next week so I figured I’d jump in 🙂 2 quarts = 8 cups. Enjoy those berries & let us know what you make! To freeze, wash them gently (not too much water), remove the hull and freeze them on a tray without them touching each other. Once they are frozen, you can add them all to a freezer bag or freezer friendly container. And yes, a berry pie in the dead of winter would certainly be heavenly!! Went and picked more strawberries. Out of a total of 15 pounds. I made this awesome pie, canned 16 8 oz jars of strawberry jam. 8 regular and 8 vanilla strawberry. Getting ready to freeze the rest. WOW! So amazing Benita! I’m excited for you to get to eat strawberry jam all winter! Won’t that be lovely? Thanks for letting me know you made the pie! 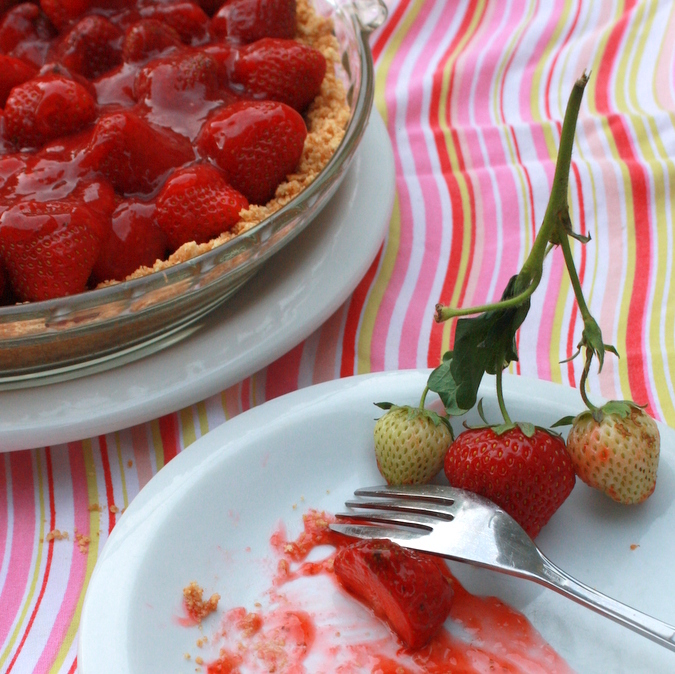 Strawberries are SO my favorite and strawberry pie is my favorite summer dessert. This looks amazing! Yup. I’m all about the graham cracker crust. I have YET to master the pie dough crust! Happy strawberry picking Kelly! Oh, my, this looks great! As soon as I get some strawberries in my CSA I will make this! I love how easy this is! 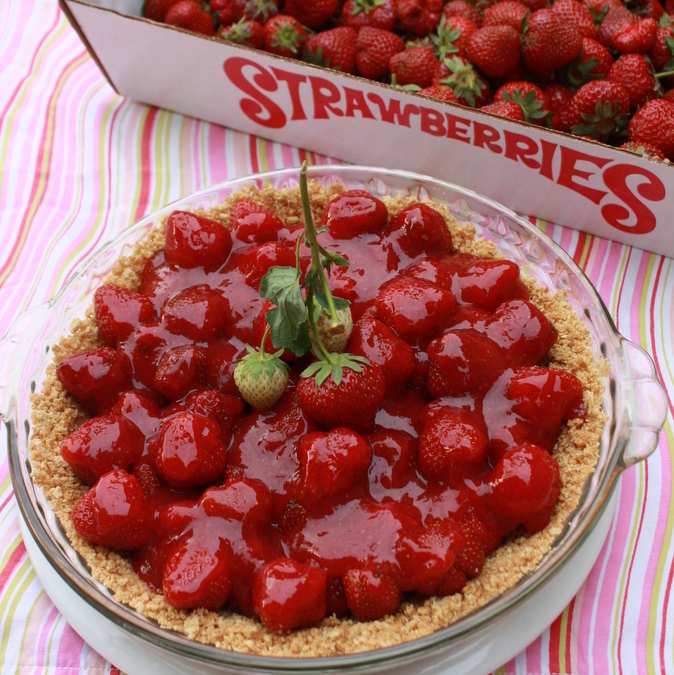 We love strawberry pie, definitely trying this one! Oh good! You will make it all summer long Alison. Cheers to making more pie! What a stunning summertime treat! Love how simple it is to make too. Will have to try when our local berries are ready to be picked. Ive been on the look out for a simple strawberry dessert for a long time. This one is perfect. A definite crowd pleaser!